More than 300 Native American nations and indigenous people from "Earth" have converged on Standing Rock in North Dakota since April to protect water against the construction of the Dakota Access pipeline, saying it would jeopardize the tribe’s water supply and threaten sacred tribal sites. Early on Monday, a Facebook post said that the Morton County sheriff’s department was using Facebook check-ins to target people at the protest camp. 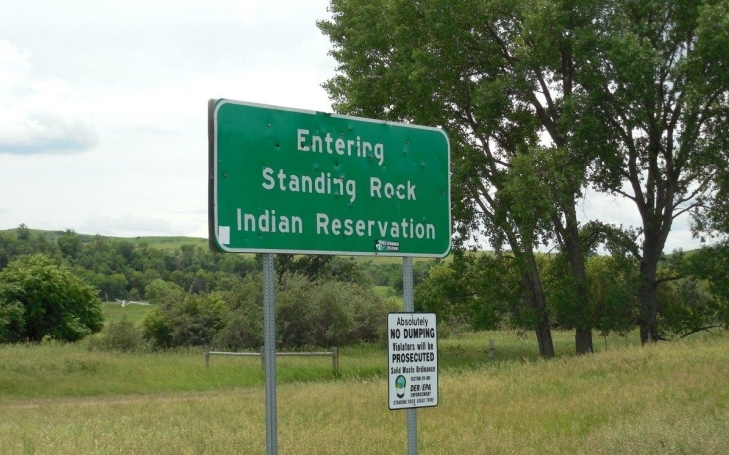 “Water Protecters are calling on EVERYONE to check-in at Standing Rock, ND to overwhelm and confuse them,” the post said, going on to urge that everyone copy and share the text along with their check-in. The origin of the text is not known. But it is spreading quickly; the number of check-ins at the Standing Rock reservation page went from 140,000 to more than 870,000 by Monday afternoon. A spokesperson for the Morton County sheriff’s department told the Guardian in a statement that it was “not monitoring Facebook check-ins"
Responses to "Standing Rock: One million people 'check in' on Facebook to support Water Protectors"
As Joni Mitchell sang, "Good Air, Good Water, Good Earth" - we appreciate your stand, against the forces of corporatism and unrepresentative government. Keep strong, we're with you. If my family could be there...we would be. You are supported by so many, all over the world, and in our home. If I didn't have to attend my daughter's needs I would certainly be there to support the cause !!! I am there in spirit though !!! Thank you, from Australia, standing with you in spirit. You're supported world wide against this tyranny, stand strong brothers. We honor your hard work and protection of OUR water rights and send strength and support! I am humbled by your stand! Standing with you, stay strong. I wish I could be there with you. From Northern Ireland. I stand with Standing Rock!!!!! Standing with you in Dallas, TX., with heart and mind. I'm Cuban living in Florida, and I stand with you, let's protect our planet �� our ��!!!!!!!! We are with you 100%. Stay strong. My heart and spirit stands with you. Wiyaka Eagleman, if I had a body that could physically be there to support all of you I would. So please know, it's not for a lack of wanting but a lack of ability. Blessings upon all those that are there and those standing with you elsewhere in the world. Water is life. I stand with Standing Rock. 100% Ojibwe from Mille Lacs Reservation Minnesota. If I had the money to make the trip I'd be there with you all. All the way from the east coast, my heart goes out to you. i stand with the people of Standing Rock! they are fighting for all people to survive..
We stand with you in the spirit and with Aloha from the islands of Hawaii ! I would love to be there standing by you. But, I have my own battles too, I have cancer and am fighting to be able to live just for today. All I'm able to do is pray for each of you and I'm sorry if that don't feel like enough for you sometimes. We stand with you "Standing Rock"! !You're all Protecting " our children's children"Water is "Priceless". Standing in solidarity with you. Thank you for your commitment. My heart and prayers to my brethren in Standing Rock! Que el Espiritu de hermandad nos una en esta lucha contra la injusticia. Nuestra Madre Tierra, nuestros hermanos y hermanas, Rio, Agua, Aire, Sol, Flora, Fauna, Pajaros y Peces, todos se unen a la lucha. La Luna y las Estrellas nos protejen de noche, unidos en vigilia. Lets give respect, where respect is due. This First Nations lands and rights. My prayers are with you in this matter. I support your struggle. Went to Standing Rock Sioux encampment over Labor Day weekend. I'm proud of the Water Protectorate, especially Chairman Archambault and the nonviolent emphasis to protect water rights. My relatives, friends n associates Stand with you. May the Creator bless n protect you. We stand with you all, we would love to be with you but we are too far away (Mozambique), but you are with us is spirit , in our heart and thoughts. let us know how we can help in your struggle that is the struggle of all of us, the right of water and life. I stand with you, special people :) Malta, Europe. In spite of an aching heart, I am with you in spirit! I stand with Standing Rock!!! As one who worked with Russell Means back in the day and other activists, I am sorry that my own cancer has prevented me from being on the front lines. Our pipes and prayers are always with you. I, AND MANY OTHERS STAND WITH STANDING ROCK!!!!! We are with you! Standing tall, standing strong, Standing Rock.